Canadian academician Marshall McLuhan noted in his 1964 book Understanding Media that “the globe has contracted, spatially, into a single large village” because of existing communication technologies at that time. Just imagine how dramatically the world had contracted the past ten years because of social networking sites. Filipinos have embraced the social media in a big way – it has been cited as the social networking capital of the world many times in recent years. According to InternetWorldStats.com, nearly 90% of all Filipino internet users have a Facebook account. I cannot remember a day when I went online without checking my social networks. That hasn’t always been the case for me. When I was a second year high school student back in 2004, I was actually behind others in having a Friendster account. I still remember how amazed I was back then when I got to reconnect with my elementary classmates – folks I haven’t heard from in over two years. So that’s how I utilized the social media initially. Now, it is not an exaggeration to say that the social media has influenced my life at present to a great extent. When I was younger, letters sent via airmail and overseas phone calls were the only means by which I interacted with my aunt and her family in the United States. Both leave much to be desired. Thanks to our antiquated postal system, I once received a Christmas card shortly before Valentine’s Day. The cost of overseas calls on the other hand can be extremely prohibitive, and this negatively affects the quality of interaction. And contrary to what a famous PLDT NDD ad shows, a few minutes are usually not enough to talk about pressing family matters. Being an avid news junkie, it didn’t take long before I began using Friendster as a platform to express my views on political issues at that time. On my ‘bulletin board’ there, I posted my insights about the scandals engulfing the administration of Gloria Macapagal-Arroyo. By 2007, I created an account in Multiply.com, and this marked my first foray in blogging. Aside from having an online portal for my written school outputs, the blog also served as a means for me to air my take about the campus politics in UP Diliman. Looking back, I realized that I largely stuck with that formula, although I now write more about national politics and with a decidedly wider readership. My engagement in social media eventually prompted me to do a thesis about how the 2010 presidential candidates used the said technology as part of their campaign. A year after doing that research, I put up this blog. From receiving less than 10 views a day on its first three months online, The Filipino Scribe is now getting 1000 hits daily on the average. This blog has opened up a lot of opportunities for me personally, but what really gives me a kick is the fact that in my own way, I can share to Filipinos worldwide information and insights about issues they care about (holiday pay rules, political controversies, etc.). To a great extent, we can say that the social media has empowered not just bloggers like me but also essentially everyone who has access to the Internet. As they became more enamored with the technology through the years, Filipinos have learned that there is more to Facebook and Twitter than just bringing friends and families together. Nowadays, it is not surprising to see Filipinos overseas react to news from the Philippines ahead of their countrymen here. They no longer need to subscribe for a fee to The Filipino Channel just to get news. Facebook and Twitter have become reliable ways of sharing news. Filipinos here and around the world can throw their two cents worth on everything with no restrictions. In other words, they need not worry anymore if media gatekeepers will publish their comment or not since no one can stop them from saying their comments on the social network accounts. 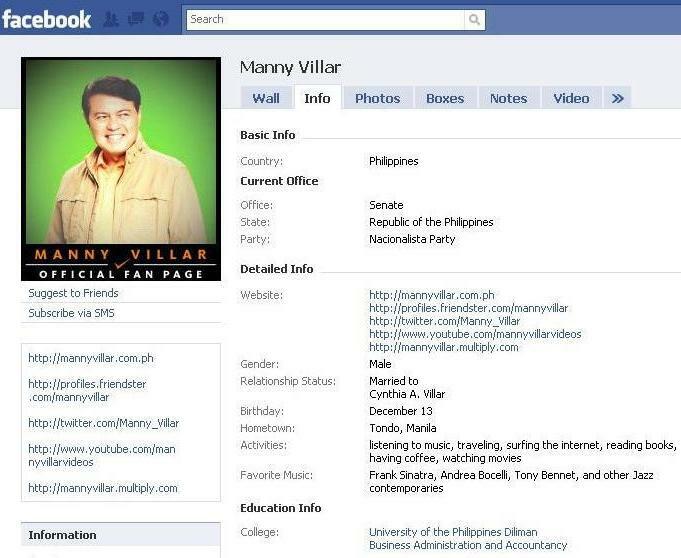 A Filipino living in Florida, United States for instance founded the Facebook group Anti-Pinoy, a page which features no-holds barred discussions on Philippine issues. This year, we saw that social networking sites can be used by the public to hold their elective officials accountable for their actions. Usually, this can only happen during elections. Senator Vicente Sotto III and Manila Rep. Trisha Bonoan-David learned it the hard way. When Bonoan-David filed an ill-advised House bill that seeks to require departing overseas Filipino workers to pay US$50 as contribution to the Overseas Workers Welfare Administration emergency repatriation fund, OFWs everywhere launched an online revolt which prompted the solon to withdraw her proposal. Sotto, for his part, remains the subject of online ridicule because of his apparent lack of knowledge about what constitutes plagiarism. Let me conclude this post by making some predictions as to how the social media will be a catalyst in making Filipinos more productive in charting their future. In the same way that I used the 2008 United States presidential elections as a guide in writing my thesis two years ago, I am once again looking up to America for some inputs. In the coming elections, we can expect politicos to use to rely increasingly on the social media to reach their constituents. However, the medium can also work against them. The Internet can be used extensively in examining the background and political positions of those aspiring to lead us. Since so much information are now readily accessible, there’s no more excuse for voters to remain uninformed. The social media then becomes like a Damocles sword against people who think they can lie and lie to win political power. That’s people empowerment at its best, isn’t it? Thanks to the social media and other related technologies, the cliche “malayo man, malapit din” has become truer than ever. Once upon a time, I saw Friendster and Multiply mainly as a means for me to look for long lost classmates and my numerous crushes. Although I still do that, the social media has become much more meaningful to me as I elucidated above. 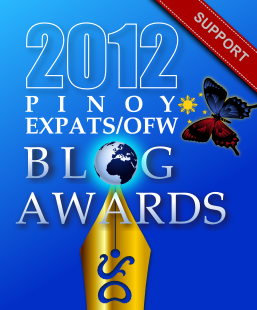 This entry was posted on Thursday, November 15th, 2012 at 11:50 pm	and tagged with 2012 philippine blog awards, 2012 pinoy blog awards, 2012 pinoy expats ofw blog awards, blog awards philippines 2012, overseas filipino workers, politics and social media philippines and posted in hodgepodge, philippines, politics, social networking sites. You can follow any responses to this entry through the RSS 2.0 feed. In intervening years, e-commerce has gained a foothold, websites have increased tenfold while online shopping sites, blogs and social networking sites like Friendster, Twitter and Facebook which has a following of around 20 million in the Philippines, have grabbed the attention of Internet surfers and tech-savvy individuals all over the world, pushing cyber-criminals to modify their act or wear a new hat altogether. you made running a blog look easy. The whole glance of your web site is fantastic, let alone the content! and audio cds aand transcripts. I’m gone to say to my little brother, that he should also pay a quick visit this weblog on regular basis to get updated from newest reports.